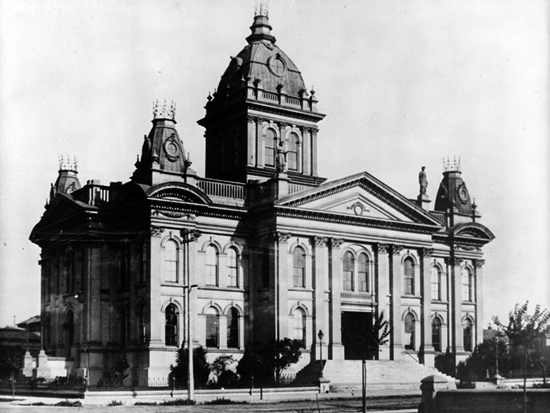 Alameda’s Victorian courthouse was built on Oakland’s Washington Square after the county seat was moved from Alvarado (part of present-day Union City) to San Leandro and finally to Oakland. The ornate brick building had fallen into disrepair by the mid-1920s (judges called it a “vermin-infested menace to health and records”). During heavy winter rains in its final years, bailiffs held umbrellas over the bench to shield judges from leaks. In 1936, a new county center on Lake Merritt replaced the old courthouse, which county supervisors voted to demolish in 1949.